Royal Grass® has a beautiful and natural appearance. To achieve the best results, we recommend our artificial turf is installed by an experienced professional. Royal Grass® does not only sell artificial turf. Our carefully selected dealers provide a complete solution with comprehensive customer service. They are gardeners and landscapers who are trained experts in our artificial grass products. Through their passion for beautiful lawns, they have developed the laying of artificial turf into a true art. When you choose a Royal Grass® Dealer to install your artificial lawn, they will help you to create a dream garden. Before installation, an experienced specialist will evaluate the drainage, the substrate (the surface beneath the artificial turf) and the type of artificial turf that is to be applied. The substrate must be able to carry weight and effectively drain water. In some cases, it is important to make adjustments to the substrate before installation. Artificial grass can be applied to almost any surface including soil, sand and concrete. During installation the grass should be cut to size correctly, the edges should be tidy and the seams should be secure. Royal Grass® Dealers are trained in all of these areas so you can enjoy a perfect artificial lawn installation. Are you a keen gardener or DIY expert? Then it is possible to install the artificial turf yourself if you are well prepared with the right tools. 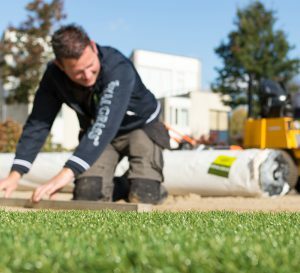 Although we recommend using a Royal Grass® Dealer for the best results, we are happy to provide the information to perform the installation yourself.